Here is the new Mercedes-Benz GLC Coupe, making its debut at the New York International Auto Show. The long-awaited model is Mercedes-Benz’s second coupe SUV, positioned under the larger GLE Coupe and is here to directly rival the BMW X4. Based on the same platform as the X253 GLC, the GLC Coupe is 80 mm longer and 40 mm wider. Its full dimensions are said to be 4.73 metres long, 1.60 metres tall with a wheelbase stretching 2.87 metres. Weighing 1,710 kg (GLC 250 4Matic Coupe), Mercedes-Benz also claims that its compact coupe SUV is the lightest vehicle in its class. Two exterior body style options are available – the standard look (pictured in brown) and the AMG Line look (pictured in blue). As standard, the Mercedes-Benz GLC Coupe gets the single-lourve diamond radiator grille, rugged-look front and rear aprons, 18-inch alloy wheels and a Chrome exterior package. The AMG Line adds more aggressive bumpers, while optional wheel sizes range up to 20-inch items. 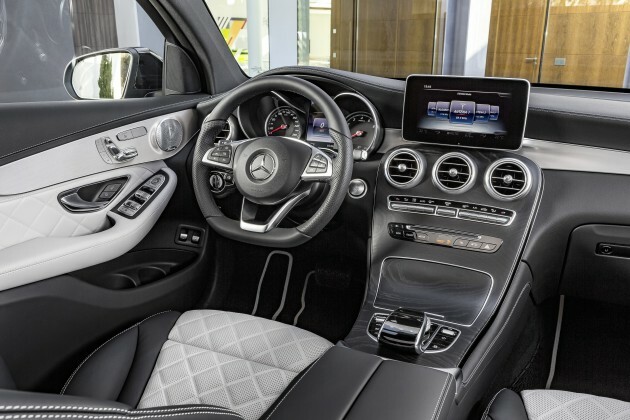 Inside, the GLC Coupe gets more standard-fit items than the regular GLC, including an Audio 20 CD system, reverse camera, Keyless-Go engine push-start button and Artico man-made leather upholstery. The cabin’s layout and feel directly mimics the regular GLC SUV, with an optional AMG Line interior and several designo items to choose from. If you’re worried about boot volume, yes, the GLC Coupe does lose ground against the GLC SUV. The new coupe offers 491 litres of volume with the seats in its standard configuration. Seats folded, it has a maximum of 1,205 litres. Comparatively, the regular GLC SUV has a standard volume of 550 litres and 1,600 litres with the rear seats folded flat. A total of eight engine variants will be available by the end of the year. This will include a 320 hp GLC 350e 4Matic plug-in hybrid and a 367 hp GLC 43 4Matic Coupe. For its European market launch in September, however, Mercedes-Benz will just release three of these variants. Two diesels and one petrol variant will come first. Diesel power for these will be supplied by the older OM651 2.1-litre four-cylinder turbodiesel unit. The GLC 220d will offer 170 hp and 400 Nm of torque, enabling it to go from zero to 100 km/h in 8.3 seconds. The GLC 250d will have 204 hp and 500 Nm, performing the century sprint in 7.6 seconds. Petrol power is supplied by a familiar M274 2.0 litre four-cylinder turbo. As the sole petrol variant for now, the GLC 250 will have 211 hp and 350 Nm and will go from zero to 100 km/h in 7.3 seconds. As standard, all GLC Coupe variants will feature a 9G-Tronic nine-speed torque converter automatic transmission and 4Matic all-wheel drive. Only the coming GLC 350e plug-in hybrid will maintain using the 7G-Tronic auto transmission (revised for plug-in hybrid application). Mechanically, the GLC Coupe features two notable changes over the regular GLC SUV. This includes a sportier configuration of the Direct-Steer system and a standard-fit sports suspension. Optionally, buyers may specify an even sportier Dynamic Body Control suspension or the Air Body Control air suspension. A sports exhaust system is also optionally available for the GLC Coupe. As with all new Mercedes-Benz models, there will be a limited run of a GLC Coupe Edition 1. Details are scarce for now, but the model is set to gain an AMG Line exterior, 20-inch AMG light-alloy wheels, designo paint finishes and a bi-colour look leather upholstery. Mercedes-Benz GLC Coupé, Innenausstattung designo platinweiss/schwarz. Come on. This is ugly! How to beat X6? How can a paultan reader didnt know this? This is meant to compete with x4. Competitor for x6 is GLE. Its been ages already. OK this time the X6 wins in the exterior looks department. The GLC Coupe somehow looks a tiny bit too long. Pretty sure this isn’t in the same category as X6..
it seems like neither of you really read the article. the very first paragraph: “The long-awaited model is Mercedes-Benz’s second coupe SUV, positioned under the larger GLE Coupe and is here to directly rival the BMW X4.”. yes, GLC Coupe is the same class as the X4 not the X6. leave that job to the bigger GLE Coupe. The GLC competes with the X3, Q5 and XC60, while the GLC coupe competes with the X4. The GLE competes with the X5, while the GLE coupe competes with the X6. So yes, you’re right. The estate version looks much better! More upmarket etc. This looks like a squashed frog.